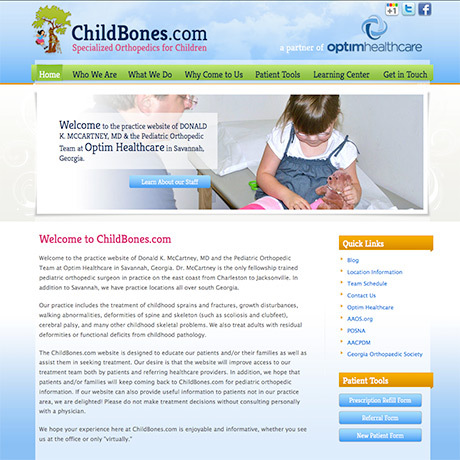 Donald K. McCartney, MD and the Pediatric Orthopedic Team at Optim Healthcare in Savannah, Georgia specialize in childhood othopedics. Dr. McCartney is the only fellowship trained pediatric orthopedic surgeon in practice on the east coast from Charleston to Jacksonville. In addition to Savannah, Dr. McCartney has practice locations all over Southern Georgia. 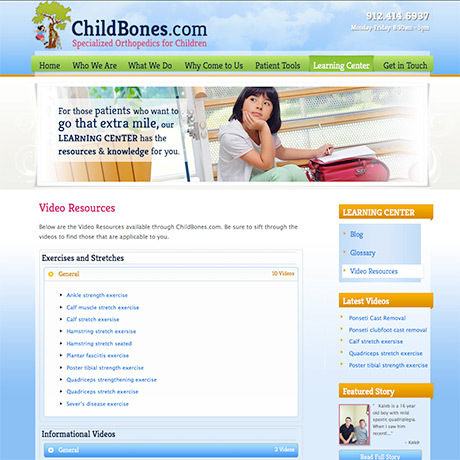 In the development of Child Bones, there were some key pieces that we wanted to implement. Two of the biggest pieces were secure forms and the interactive calendar. For the secure forms, the goal was to have the patient fill out a form before getting to the doctor and sending it via e-mail to the healthcare provider, a goal that we achieved; The form on the site automatically sends a pdf document of all the information to the health care provider. This tools was set up for prescriptions, new patients, and referrals. The second piece we implemented was the interactive calendar. This was an essential piece because of Dr. McCarthey's style of practice. As he moves between healthcare facilities, people have to know where he can be found, so that made the calendar function an essential. What the calendar does is provide an expanding view of his schedule for the current month, which can also be viewed full size. 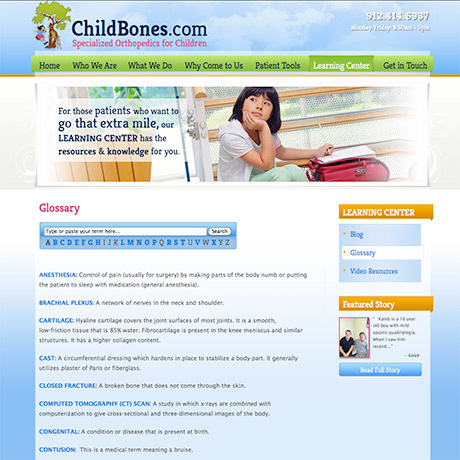 In addtition to these two major pieces, we implemented a glossary of terms used in the site, created a portion for videos to supplement patients that needed routine care, which would eliminate the need for unnecessary visits, and incorporated patient stories, which they could upload to the site as a testimonial.